Many of the population have a garden shed for storing lawn mowers and garden tools and with new build properties getting smaller and less storage solutions available, the garden shed is just the solution to keep such items. If you are looking to erect a shed in your garden then check out our top tips on how to put up a garden shed. Patio slabs are an ideal foundation for a garden shed, but it is imperative to ensure that the slabs are fitted evenly. It is advisable to use a spirit level to check that the paved area is level otherwise the shed may be constructed out of alignment which in turn will cause issues with the door functioning. Typically, a layer of sand is used to level the slabs before cement is used to fix them into place, be sure to follow the instructions allowing time for the cement to dry. Most sheds are supplied in a flat pack format. Usually the base is laid first, followed by the sides. Once this frame work and side panels are in place the roof is then added, followed by a protective membrane to ensure the shed is water tight and increase its resistance to the elements. If your shed has windows, then these will likely be installed last of all. It is important to read and follow the manufacturers assembly instructions as they will detail the most relevant information for installation. 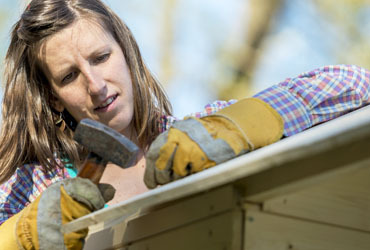 Once you have built your shed, don’t forget to secure it. Typically a hasp and staple along with a key operated or weatherproof combination padlock would be used to prevent access being gained by any unwanted persons. For more home and garden improvements, why not check out our previous blogs, Creating Your Perfect Summer Garden and Improving Your Home Security.